Today's drive took me through Kingman, Arizona. For some reason Kingman has magic significance for me. 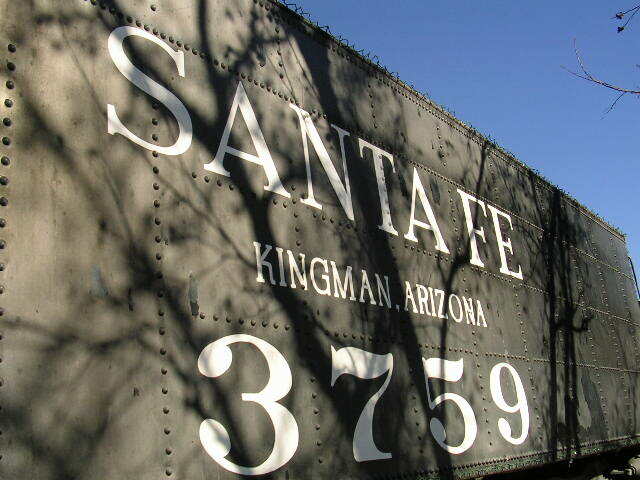 In 1967 we took a family trip through the southwest, including a stop in Kingman. Today, driving into the run-down historic section of Kingman I instantly realized what was magic. For a twelve-year-old city kid, a big old-fashioned locomotive with a caboose is pretty magic stuff. My brother and I climbed all over it. 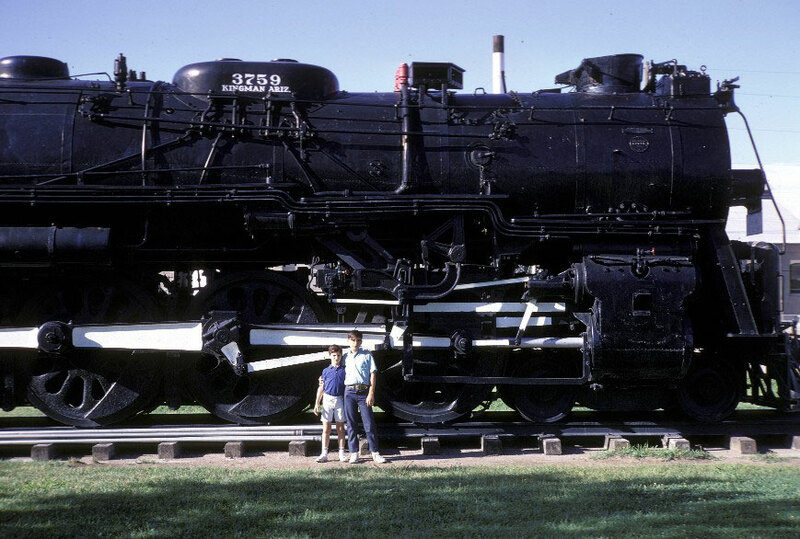 My father sent a pic of the two of us, in 1967, posing in front of the train. 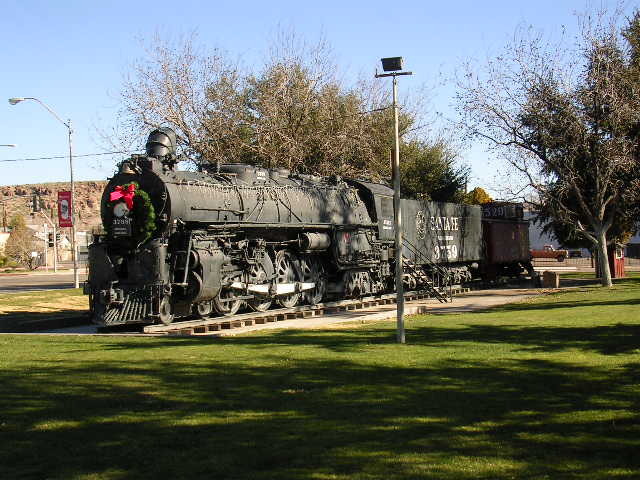 A real 21st century train in Kingman on Route 66. Today's drive: Las Vegas to Sedona. Thanks Susan, it's an honor to be one of your favorite blogs of 2004. Bart Simpson: ""This is the time of year when people of all faiths get together to worship Jesus." Scott Rosenberg of Salon traces an incredible statement crediting Slate with inventing the hyperlink and weblogs. To add a little fuel to the speculation, while Mickey Kaus is a thoughtful and nice person, to be sure, (and Slate's premier blogger) he did ask me if there were blogs before his, because people in his 'sphere often credit him with being first. Speaking of wrong things, expect a spate of articles about the arrogance of bloggers, now that the PowerLine guy is getting interviewed on radio saying that people who get paid to write aren't so smart. My buddy and wing-man is in Amsterdam, sucking down content from a big pipe. Here's a movie I shot while recording yesterday's podcast while the Beatles were singing Revolution. Personalization is the key to the future of search, according to the BBC. Here's a simple way to do it. Tell Google -- "This is my weblog" or "this weblog reflects my interests." Now when you do a search, they give extra weight to links from that site. I'm not sure if this would be great, but I'd love to give it a try. Scoble, thousands of independent developers worked for free at the same time this Apple guy worked for free. Some very cool software. That was one of the big problems with being a developer at that time, people thought all the cool software came from Apple. Guess they still do. After the weblogs.com hosting debacle surfaced yet again by people trying to reignite the flames, I decided to try to discuss it again with David Weinberger, whose comments in the middle of the flamefest are widely cited as evidence of how I didn't do all I should have done to notify people with blogs on weblogs.com. I know David to be a thoughtful, careful and considerate person. And to this day well-intentioned people question my integrity over these events. That's not cool for a person such as myself who values his integrity. We reviewed the options that people suggested at the time, 1. Send an email, or 2. Post something on Scripting News. Neither would have worked, the mail addresses were four years old and probably didn't work, most of the sites never got past the Hello World stage (so the authors might not remember creating the site, and certainly don't care), and most people with free sites weren't and probably still aren't Scripting News readers, any more than most Blogger users were Evhead readers. Posting something on Scripting News wouldn't have notified the users, but it sure would have notified the flamers. I think they were saying that they were complaining that they weren't told in advance that it was time to rip me a new one. Anyway, he posted a correction, so next time this comes up, as it is sure to, the flamers won't be able to use him to support their attacks. Thanks! "Christmas stinks. I am not one that suffers that holiday depression thing, but the pressure got to me last night and I broke down, cried for about 5 minutes. "Then I saw your essay this morning, what a relief. You didn't say you hate Christmas but it was a relief to be reminded that someone else out there does not love it. I finished my shopping and it wasn't so bad." Glad I could help. It's true, I don't hate Christmas as much as I resent having such a large chunk of my life taken for a cause I have no stake in. Last update: Friday, December 24, 2004 at 7:31 PM Eastern.